Wolfenstein 2: The New Colossus does not seem to be a game from 2017. It’s an oddity in an industry that is currently obsessed with open-worlds, micro-transactions, and always online play. It has none of those, and this sequel to 2014’s fantastic Wolfenstein: The New Order just sticks to its roots as a first-person shooter. Wolfenstein 2 begins immediately after the events of previous game in the series. Set in an alternate universe where the Axis forces won the Second World War, you’re back in the role of series protagonist William “B.J.” Blazkowicz, and are tasked with setting up a revolution in America, to fight against the Nazi regime that was set up after the dropping of an atomic bomb in Manhattan. Despite the ‘2’ in its name, you don’t need to play Wolfenstein: The New Order to understand what happens here. A cut-scene at the beginning fills you in on the events of the last game well enough. Like the last game, you’ll gun down a seemingly endless number of enemy infantry, apart from super soldiers, and giant robots. There’s an outrageous set of weapons to use, ranging from triple-barrelled shotguns to flamethrowers spewing fireballs, each of which feels unique in terms of weight, handling, and recoil. They’re distinctive, loud, and a treat to use. Most of them are also capable of being dual-wielded, allowing you to wreak twice the havoc. 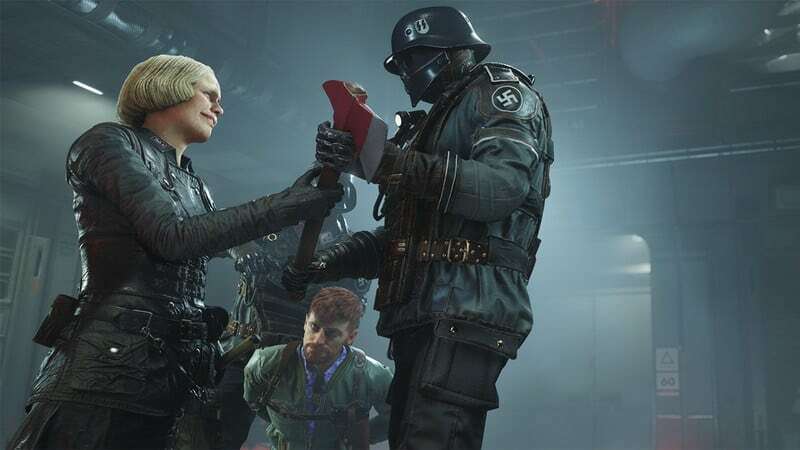 Dual-wielding in Wolfenstein 2: The New Colossus, much like in the previous game, isn’t restricted to two weapons of the same type either, making it possible to use a shotgun in one hand, and a submachine gun in the other. The core gameplay in Wolfenstein 2: The New Colossus will feel familiar to anyone who played Wolfenstein: The New Order. The shooting is satisfying, with human enemies exploding into puddles of blood, while exotic weapons like lasers simply melt through the opposition, both human and robotic. There’s a welcome attention to detail with bigger, ironclad foes losing parts of their armour as you rain down a hailstorm of bullets on them. Some new weapons, such as the diesel-powered grenade launcher, are a treat to use and the star of the show has to be the humble hatchet. It’s much easier and faster – as well as visually gratifying – to chop down Nazis by lopping off limbs before severing off the head. These axe attacks are, indeed, the star of the show. But developer MachineGames wasn’t satisfied with leaving things as they were. As you play Wolfenstein 2, you’ll realise that you have options at your disposal that open up new traversal and killing methods in a level. Early on, you’ll slam down on grates to get to an objective, and later you can slam into sheets of metal to open new pathways. You can use stilts to get to vantage points if you choose to, and these abilities complement the gunplay well. Aside from opening up new pathways, ramming into the game’s heavy armoured Supersoldaten stuns them for long enough to hit them with a barrage of shotgun shells, for a quick yet fulfilling kill. With the use of your various abilities, the levels really open up to you. 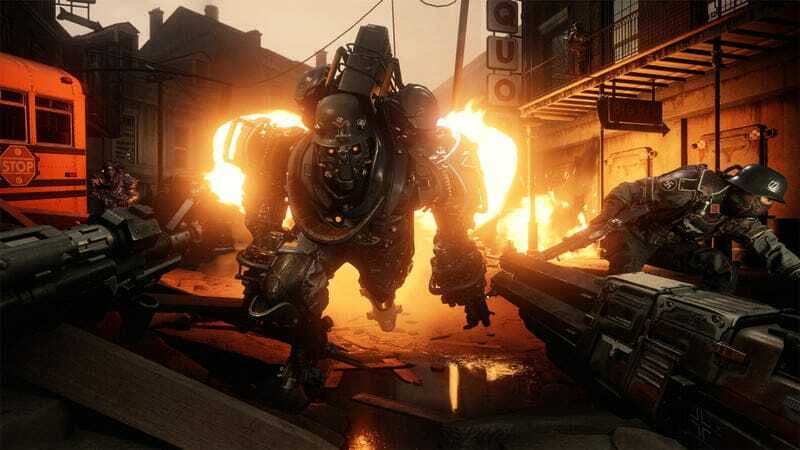 Be it taking down an entire squad of Nazis on a rocket train, riding a fire breathing mech through the streets of New Orleans, or exploring the nuclear ruins of Manhattan, Wolfenstein 2: The New Colossus never ceases to amaze in its scope, scale, or opportunity to raise hell in the way you choose. But perhaps the biggest reason to keep playing Wolfenstein 2 is its story. There are plenty of twists and turns in addition to a host of moments that make slicing and dicing computer generated Nazis seem like the most peaceful thing in the world. Without spoiling much, we can safely say this is one game that deserves its 18+ rating. By the end of it, it’s easy to feel Blazkowicz is more human than most of the game’s cast, instead of being just your average video game killing machine. He’s backed up with a host of colourful characters including Super Spesh, a one time lawyer now conspiracy theorist; Grace Walker, a US resistance leader; and of course the crew of the first game – Bombate and Set Roth to name a few. The voice actors are tremendous across the board, though the game’s antagonist, Frau Engel voiced by Nina Franoszek stands out, making the role of the psychotic Nazi leader come to life with a sense of aplomb akin to Vass from Far Cry 3 or Visari from Killzone 2. We had only a few concerns with Wolfenstein 2: The New Colossus. It’s a great looking game, standing right next to Id’s Doom with some of the best visuals we’ve seen so far this generation, but it would be nice to have some options – like choosing between frame rate and resolution, or simply giving users an HDR toggle. PS4 Pro and prospective Xbox One X owners would like to see if there are any tangible benefits to playing it on a souped up console rather than just having the box or the game’s digital store page simply saying it’s “enhanced” for either console iteration. Sure, most games don’t have these options, but for a game like this, which is a showcase for the hardware you’re playing it on, it would be nice. That aside, we noticed slight texture pop-in, wherein details on guns would show up a little slower than usual – hopefully this gets rectified with a patch. Clocking in at around 15 hours, Wolfenstein 2: The New Colossus is a big, booming shooter with a well-paced plot, slick levels, and great gunplay – package we don’t see very often in 2017. October might be a crowded month, but this one game that needs to be experienced. Gadgets 360 played an early retail copy of Wolfenstein 2: The New Colossus on PS4 Pro. The game is available for the PS4 and Xbox One at Rs. 3,999 and the PC at Rs. 2,999 ($60 in the US). We discuss Wolfenstein 2: The New Colossus in-depth on Transition – Gadgets 360’s gaming and pop culture podcast. You can subscribe to Transition via Apple Podcasts or RSS or just listen to this episode by hitting the play button below.